Its nearly August – AUGUST! – and I haven’t made any popsicles or ice cream yet this summer. It’s tragic. Especially considering I bought a whole bunch of popsicle molds to start off the season. As soon as I realized this unfortunate fact, I started browsing for a batch to kick off what will undoubtedly be a rest-of-the-summer popsicle binge. 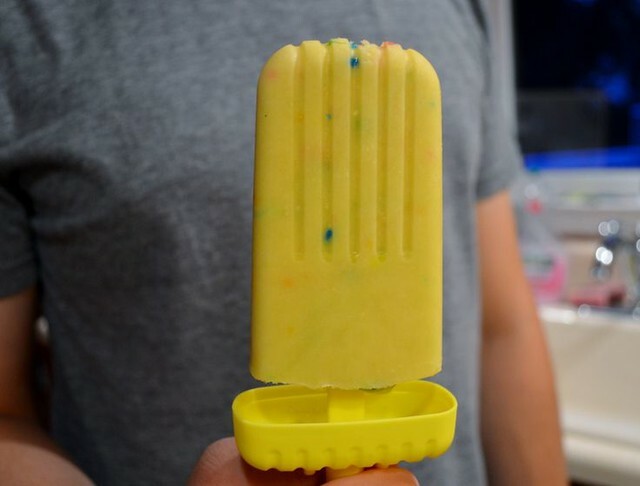 I couldn’t find exactly what I wanted, so I combined a few recipes to create these Cake Batter Popsicles. These came out amazing. They totally taste like you’re slurping down the last of the cake better from the bowl. My only regret is that I didn’t make these sooner! In a medium bowl, whisk together the pudding mix and cake mix. Whisk in the cold milk and stir until it starts to thicken slightly. Stir in the sprinkles. Pour the mixture into popsicle molds and freeze for at least 6 hours before enjoying. Love the addition of cake mix!! Yum!